In a corner of a class of three- and four-year-olds at Booker T. Washington Child Development Center in Phoenix, preschool students in chef’s hats and aprons are preparing meals for other students sitting at a table with a red and white checked tablecloth. “One more, it’s very heavy,” a student says to another as they bring the orders to the table. “What is to drink?” asks a diner. The server tells him orange juice. “How do you know?” asks their teacher Amy Corona. “There’s an orange on the box,” the boy tells her. “Do you like my meal?” a chef asks a diner. “Oh, yes. Thank you!” she says. During pretend play and other learning activities, preschool students learn how to get along, work together with their peers, wait their turn and self-regulate – important social-emotional skills that they’ll need in kindergarten and throughout their life, said Kim Pollins, MPA, executive director of this center and Head Start program that has served children from low- and middle-income families in the Eastlake and Garfield communities since 1967. That’s key, because about 90 percent of a child’s brain develops by age 5, and “that is why the job of helping children succeed – in school and in life – starts the day they’re born,” said Dr. Gayle Galligan, deputy superintendent of curriculum, instruction and assessment for Deer Valley Unified School District which provides preschool, developmental preschool and Head Start preschool services. Paying for child care and preschool can be difficult for many Arizona families with services ranging from $120 to $350 a week, depending on the child’s age, the care setting and the services the child needs and parent wants. In some cases, children with special needs or development issues or children from low-income families may qualify for free or reduced early learning tuition, but many parents need to pay for extended care so they can work a full day. For example, to qualify for Booker T. Washington Child Development Center‘s Head Start – a free, federally funded early learning program that runs from 8:15 a.m. to 2:30 p.m. each weekday for children in income-eligible families that live within certain boundaries – a family of four must earn less than $25,100 a year, Pollins said. That’s why advocates in Arizona and across the nation seek more state funding for early education. 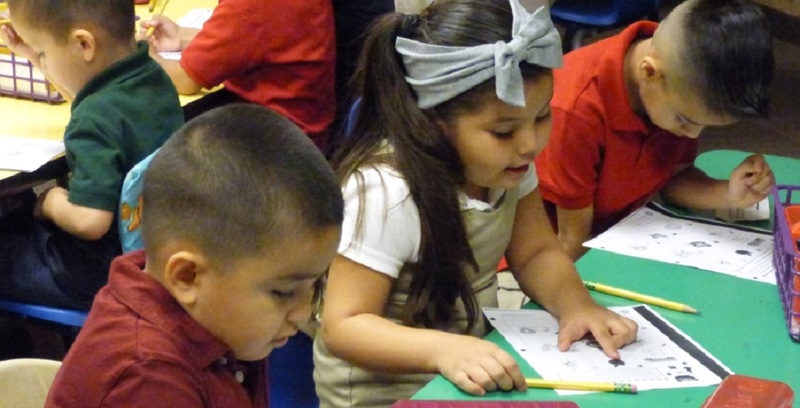 States that fund preschool recognize that economic development starts with early childhood development, and “the best state investments ensure all children, particularly those from low-income families, have access to high-quality early childhood education,” said Mindy Zapata, M.Ed., director of Head Start at Southwest Human Development, which provides services for young children in five Phoenix school districts. “Research shows that for every dollar invested in high-quality early childhood education, society gains up to $7.30 in economic returns over the long-term,” Zapata said. 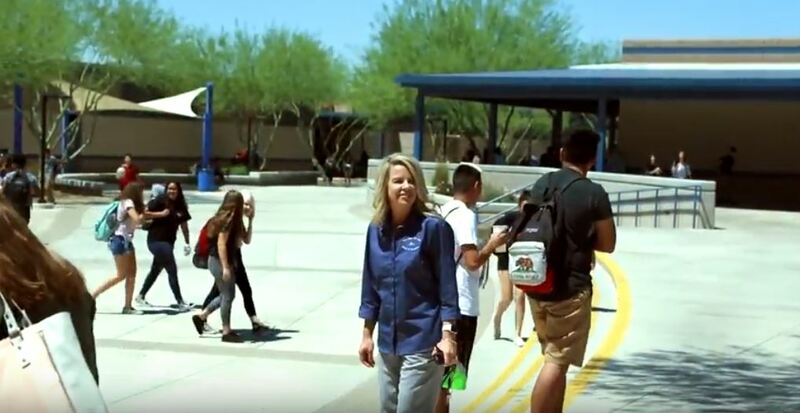 Access to high-quality child care and early childhood education provides working families in Arizona with better job stability and overall economic security, Zapata said. In May 2018, Arizona Legislators voted against spending $56 million in federal funds earmarked for child care assistance and increasing the quality of existing early learning programs that is Arizona’s share of the $5.2 billion that Congress approved in March 2018 to boost the federal Child Care Development Block Grants program. At that time, legislators said “they were unclear about how the state’s Department of Economic Security planned to use” the funds, according to an article in The Arizona Daily Star. This session, Rep. Michelle Udall and co-sponsors Reps. Leo Biasiucci, Walter Blackman, Reginald Bolding Jr. and Regina Cobb have introduced House Bill 2124 and House Bill 2125 that would authorize the Department of Economic Security to spend those $56 million in federal funds. The bills will be heard in the House Committee on Health and Human Services this morning. Increasing access to quality child care and quality preschool, allocating more state funding for child care, providing budget authority to spend the $56 million in federal funds mentioned above, raising the reimbursement rate to a quality level are among the short-term investment priorities outlined in the Roadmap for P-20 Education Funding developed by Expect More Arizona and its more than 80 partners in education, business and community organizations. That would provide access to as many as 5,000 children a month, said Liz Barker Alvarez, chief policy advisor for First Things First. “The bill that Rep. Udall sponsored and the plan that the Department of Economic Security has actually balances out access and quality, because it would spend half the funds to decrease families out of pocket costs while promoting higher quality and the other half to provide more access,” Alvarez said. Rep. Udall has also proposed HB 2517, which would provide state funding for preschool through student tuition organizations. The bill has not yet been heard in the House Education committee, because Rep. Udall is still working on amendments to it. As it currently stands, HB 2517 would require student tuition organizations to provide educational scholarships or tuition grants to children whose family income does not exceed 185 percent of the income limit that qualifies a child for reduced-price lunch according to the Child Nutrition Program. 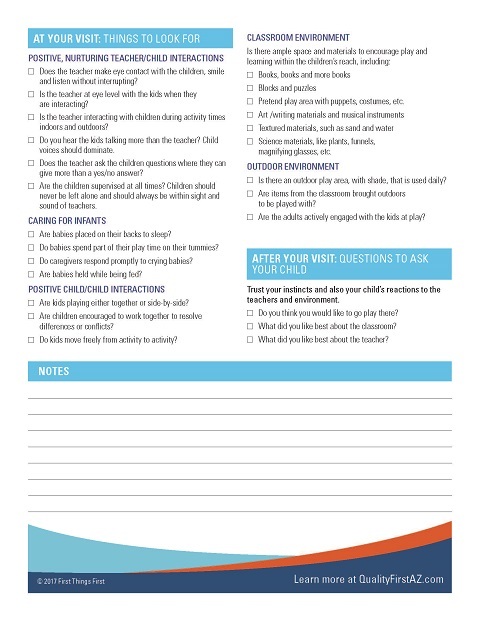 The child must have attended a preschool program that offers services for students with disabilities at a governmental school or preschool for at least 90 days in the prior fiscal year. The child must enroll in a preschool program that offers services to students with disabilities or a quality preschool program. The child is a dependent of a member of the armed forces. The child received an educational scholarship or tuition grant to attend a qualified school in a previous year. Student tuition organizations receive contributions from corporations to provide educational scholarships or tuition grants to children attending private schools. 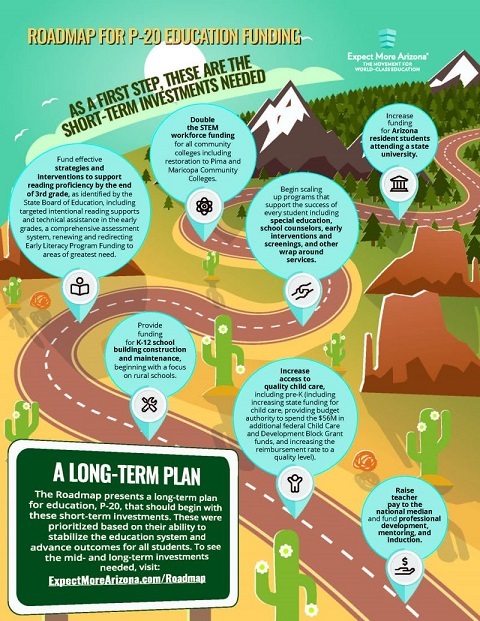 “We support public funding for preschool, but we’d rather the Legislature approve state money for the program, instead of relying on the generosity of others to provide a state responsibility,” said Chris Kotterman, director of governmental relations for Arizona School Boards Association. “We need to fund our priorities through tax policy created by the Legislature that defines how to collect the money and put it toward preschool funding,” Kotterman said. State funding for early learning would be helpful, because “a lot of working parents don’t have $250 or $300 a week (to pay) for a high-quality preschool program,” Pollins said. Quality early learning “can cost as much as college tuition, because of that it’s really out of reach for many families,” Alvarez said. 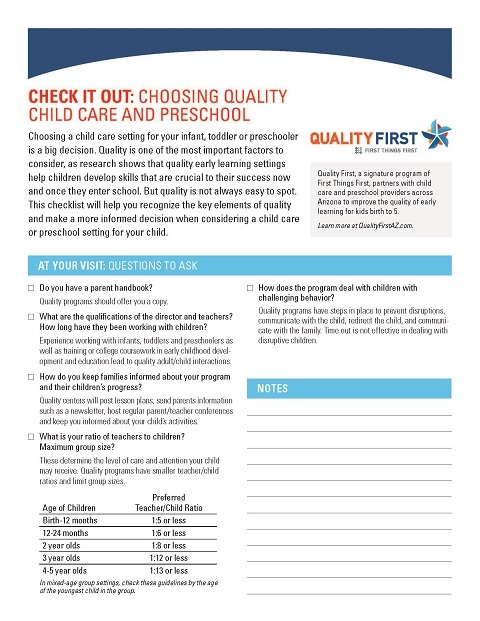 Quality First’s web site includes a checklist of what to look for in a quality early learning provider that parents can print out and take with them when visiting and choosing the right placement for their child, as well as resources about other programs to support their young child’s learning and a searchable database of early learning providers with ratings, Alvarez said. Quality First – Arizona’s quality improvement and ratings system for early learning programs – is a signature program of First Things First, which supports programs through grants to community organizations that provide services — at no cost — for young children from birth to age 5 and their families. The first time Quality First rated early learning providers in 2013 25 percent of the 800 programs met or exceeded the standards, now 74 percent of the more than 900 programs are in that 3 to 5 star range, Alvarez said. To help families afford quality early learning, Quality First provides scholarships to families who earn up to 200 percent of the federal poverty level – about $50,200 for a family of four in 2018 – to be used at early learning programs rated 3 to 5 stars, Alvarez said. Both Booker T. Washington Childcare Center and Southwest Human Development’s Head Start programs have the Quality First’s highest quality ranking of 5 stars. Booker T. Washington Child Development Center has a limited number of Quality First scholarships available for students whose families qualify, Pollins said. “Middle-income families as well as low-income families need support and assistance with high quality preschool programs,” Pollins said. High-quality early learning programs for 2-, 3- and 4-year-olds play an important role in preparing children for success and lead to higher levels of educational attainment, career advancement and earnings, Dr. Galligan said. 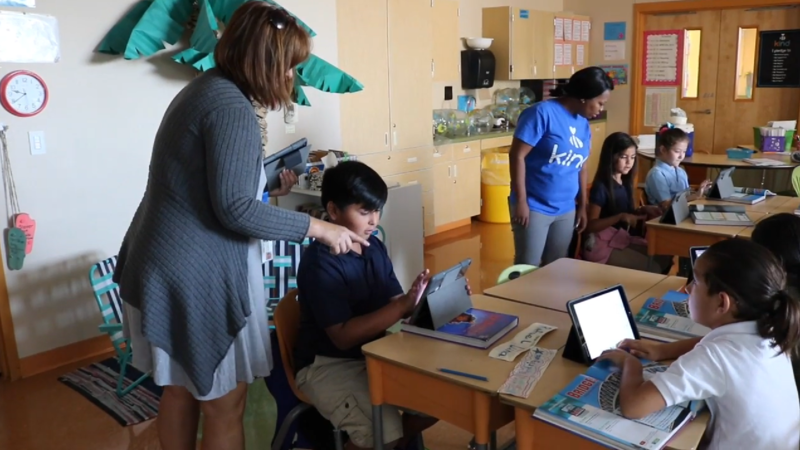 “The earlier we can intervene for children who either come to us with limited background experiences and knowledge or those who have already surpassed typical kindergarten skills, the greater chance an education system has to ensure the student has proficient literacy and numeracy skills when they promote from K-3 grades,” Dr. Galligan said. Preschool programs help level the field for learning so that it doesn’t matter what a child’s home environment, prior knowledge, interest, and motivation may be when they enter the education system, Dr. Galligan said.